Self check in. Very clean and comfortable. Right by the Old Town, so the location was perfect! Very nice apartment in the Old Center of Warsaw. The apartment is big with all you need for your journey. The check inn and check out procedure was fast and the guys on the desk very nice. The position is perfect for the turistic area and quite during the night. The location was excellent and the property and area felt very safe. The flat was large and spacious. We really liked the location, room was very nice and clean. It was private felt like home, right across from Stare Miasto with many restaurants. Located in the beautiful Old Town of Warsaw, Podwale Apartment features a fully equipped kitchen, 2 bedrooms, a living room and a bathroom with a bathtub. There is free Wi-Fi. The apartment comes with a living room with 2 armchairs, a table and cable TV. The kitchen is equipped with a stove, refrigerator, dishwasher and kitchenware. In the bathroom there is a washing machine. At the Podwale Apartment, you will be very close to all attractions of Warsaw’s Old Town, including the Royal Castle and the famous Krakowskie Przedmieście Street, just a short walk away. 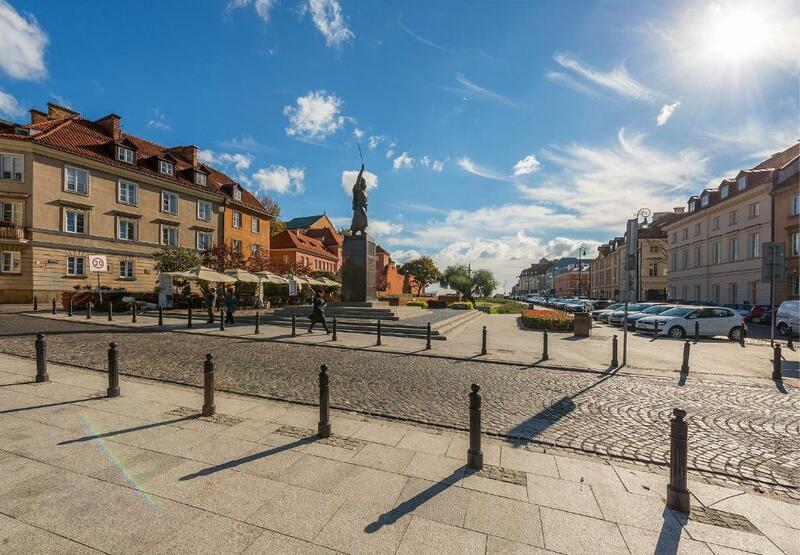 뀐 Located in the real heart of Warsaw, this property has an excellent location score of 9.1! When would you like to stay at P&O Podwale Apartments? Apartment with a well-equipped kitchen. Single beds in bedrooms can be connected and there is a fold-out sofa in the living room. This studio features a stovetop, kitchenware and cable TV. This apartment has a cable TV, kitchenware and washing machine. This studio features a stovetop, kitchenware and washing machine. We have a variety of apartments for short term letting that are located in the Warsaw city center, from comfortable and cosy ones to luxurious apartments of the highest standard. We have considerable experience in the lettings market and understand how much our services are appreciated by companies and individuals, for both holidays and business. Short-term rental is an attractive alternative to staying in hotels. Renting a good apartment is much cheaper than staying in an equivalent hotel and is often more comfortable. Our selection offers a wide range of accommodation, from compact and comfortable standard (**) and standard plus (***) apartments to luxury (****) apartments of the highest quality. This allows us to offer accommodation that best suits your needs and your budget for each trip. Our aim is to make you feel at home on your travels. We ensure that the apartments are safe and clean, meet European standards of comfort and amenity, and are completely ready for you on your arrival. House Rules P&O Podwale Apartments takes special requests – add in the next step! All children under 12 years are charged PLN 150 per night for extra beds. P&amp;O Podwale Apartments accepts these cards and reserves the right to temporarily hold an amount prior to arrival. P&O Podwale Apartments accepts these cards and reserves the right to temporarily hold an amount prior to arrival. Could not connect to internet, though we did receive a password. Needs a shelf in the shower to hold soap and shampoo. Bad customer service. Not all was in working order. The wifi did not work and the company did not fix it throughout our 4 day stay. They were not responsive to our numerous messages and requests to fix the wifi. We had to spend many hours in restaurants to use wifi for my work. Self check in took us more than an hour and long costly phone calls. The safebox did not open. The matress was very dirty and worn out and the bed linen polyester and too small so left the dirty matress uncovered. Not at all luxurious as described. Not good value for money at all. Not the apartment which there booked, diferent apartament. WiFi was not working, called for two days and nothing was made. Two times hosts said they will call back about the issue and never did. Really uncomfortable. To collect the key you actually have to go to another place in Warsaw, where they will ask for a deposit. It claimed to accommodate 3 adults, but the main bed was broken, another one was just a mattress on the floor, and the other an old couch. I don't mind old buildings, normally the apartments are nice once inside, but this place is really old, no elevator, hardly maintained. You will find notes telling you not to open the window more than 15 cms, which is understandable, but a hand-written piece of paper stuck with tape makes it so cheap. I've been going to warsaw at least once a month for the last 2 years and this is definitely in my worse 5 list. People who are considering booking, read all the info very carefully, because there's an additional fee for ! cleaning !. We were charged about 80 zlotys for cleaning upon the arrival, but once we were in the room the supposed clean room wasn't as tidy as we were hoping. I found some hair in the shower and on the washing machine that clearly wasn't mine/my partners. When I opened the leaflet whith their breakfast offer, 2 green insects crawled out of it. I didn't take a picture because I didn't want to alarm my partner /now I think I should have/. The yard was very noisy, even at night, however I do realise it's not the apartments' fault. Air Conditioner upstairs was fine for sleeping, but not for the living area, though opening the window helped. Glad it wasn't hotter. Five floors is a long way up. Pack light. Location near Old Town, WiFi, amenities. This was bad. The whole appartment was dirty and dusty, and it was several months old. Used 2 days with complaining and was promised cleaning, but nothing happend. Agree to cancel the appartment. So we booked a new one after talked with Booking.com. Terrible live like this when you got 2 small kids. Got pictures of it, if someone wish to see. The floor was dirty and they had bad quality bed sheets. The key collection place is quite far away from the property. We were told it was going to take us around 5min walk but it took around 15. The street near to the apartment is being rebuild, so it is quite dusty there, mind the fact that to cross the street you must look for a proper place to do so. The door won’t open easy. There is a huge problem with a lock. The apartment itself is super tiny but everything you may need is there. The night time is the worst, as the apartment is located on the ground floor you hear every drunk tourist passing by. If you are planning to get at least a bit of sleep, avoid this place.